"Mountains and Clouds" is the most monumental and most modern sculpture on the United States Capitol campus. It is Calder's only work that combines a separate mobile and a stabile (or standing sculpture). In 2016, the clouds were removed after a structural safety analysis was completed. They will be refabricated and reinstalled as funding becomes available. 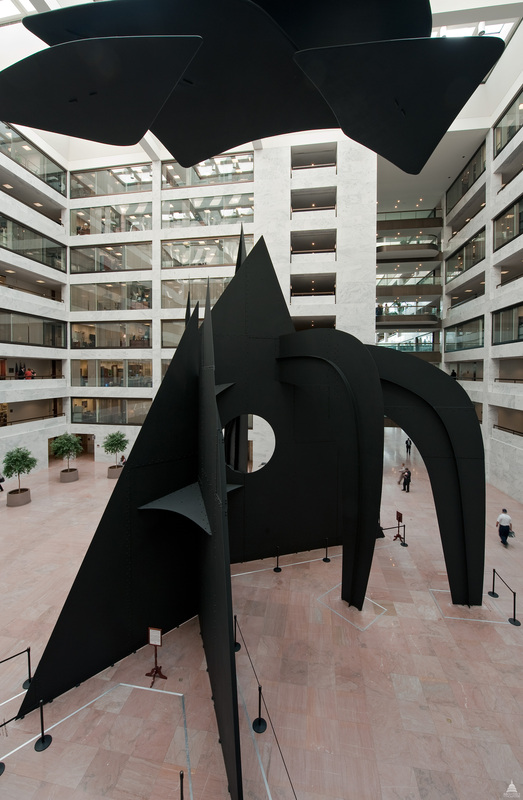 As plans for the Hart Senate Office Building developed, the need for a sculpture for the dramatic atrium became apparent. With the advice of museum curators, a list of the foremost American sculptors was compiled, from which five were selected to submit their ideas. In 1975, Alexander Calder's design was chosen by Architect of the Capitol George M. White and John Carl Warnecke and Associates, associate architects for the Hart Building. Before his death in 1976, Senator Hart also expressed his approval of the Calder design. On November 10, 1976, Calder met with the Architect of the Capitol to present the maquette and to plan the placement of the sculpture. Calder adjusted one cloud with a pair of pliers and expressed satisfaction with the maquette as placed in a model of the atrium. The 78-year-old artist died the next day after his return to New York City. In a cost-cutting move during the construction of the Hart Building in 1979, public funds for the sculpture were eliminated. In 1983, former New Jersey Senator Nicholas F. Brady personally campaigned to raise private funds for the sculpture through the non-profit Capitol Arts Foundation. The total cost of the sculpture was $750,000. The mobile elements were put into place first, in the fall of 1985. The clouds were constructed of a honeycomb aluminum core, covered with a thin aluminum skin, by Crystallization Systems, Inc. of Long Island. This same company had previously fabricated the Calder mobile hanging in the East Building of the National Gallery of Art; the success of that structural design became the basis for Calder's design of the size of the clouds. The installation of the 51-foot-high sheet steel stabile elements was completed in November 1986. The design of the structure of the Hart Building included the anticipated 39-ton superimposed weight of the stabile. Support points for the stabile were provided directly through the floor to the structure itself. The stabile elements were constructed by the Segre Iron Works of Waterbury, Connecticut, which was responsible for many of Calder's large outdoor pieces. Calder's original 20-inch sheet metal maquette for the sculpture is displayed nearby in the Hart Atrium. "Mountains and Clouds" was dedicated on May 5, 1987. The mobile component of "Mountains and Clouds" consists of four organically shaped clouds, which hang from a single shaft suspended from the roof. The largest cloud is 42.5 feet long and weighs approximately 2,000 pounds; the total weight of the clouds is 4,300 pounds. The stabile consists of five triangular mountains of varying heights, the largest pierced with a circular hole, and two curving arcs, through which pedestrians can pass. The entire sculpture is painted flat black, as Calder wished, to contrast with the white marble of the atrium. From the floor, the massive mountains present an imposing view; the entire sculpture takes on constantly changing shapes as the viewer moves to different locations or to varying heights overlooking the atrium of the Hart Building. Sculptor Alexander Calder (1898–1976) was one of America's greatest 20th-century sculptors and was renowned for his invention of the suspended moving sculpture, called a "mobile." Calder, whose grandfather and father were also sculptors, was trained as a mechanical engineer before studying at the Art Students League. As Calder moved between Paris and New York, his new ideas about sculpture were influenced by surrealism and by the paintings of Mondrian. His approach to art was essentially playful, and his forms are often biomorphic, that is, derived from natural forms. His work ranged from toys and circus animals to large-scale public sculptures and is internationally recognized. "Mountains and Clouds," his final work, is also among his most serious and impressive.